The address 7540 N 65th St is up for sale but it say's it is a FLW inspired. I am confused. "The Pieper House was spoiled by a new house in 1996, built in front of and attached to the original Wright building. Pieper was married to iovanna Wright, the daughter of Wright and Olgivanna, but later was divorced. 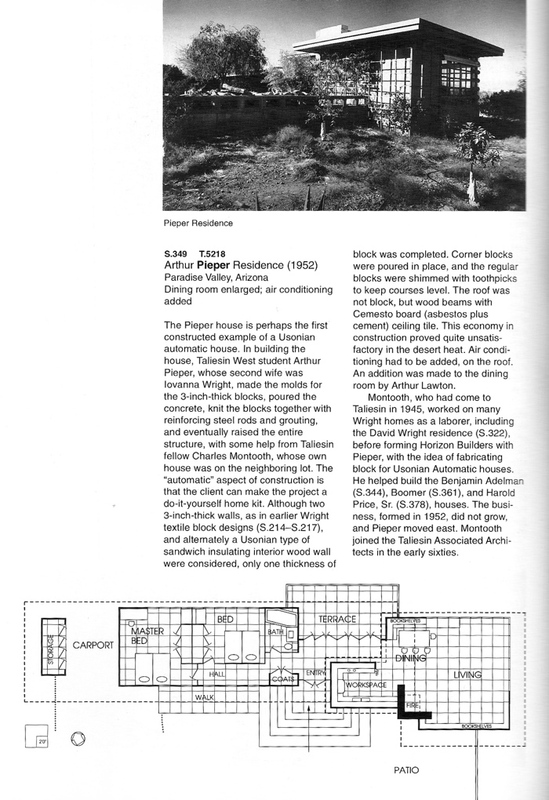 He was, for a time, in partnership with the architect, Charles Montooth (a Taliesin Fellow). The Usonian Automatic House was very small and was located to the north of two other Charles Montooth designe that are often confused with this Wright design." The Montooth houses are probably what you are referring to. Do you mean the original house was totally redone when you said nothing visible left? Just about everything, except the north facing window wall, between the living room and bedroom wing, and a view to the McDowell mountains. The removed window wall is where the connection is made to the new house which is 2 or 3 times the footprint of Pieper. 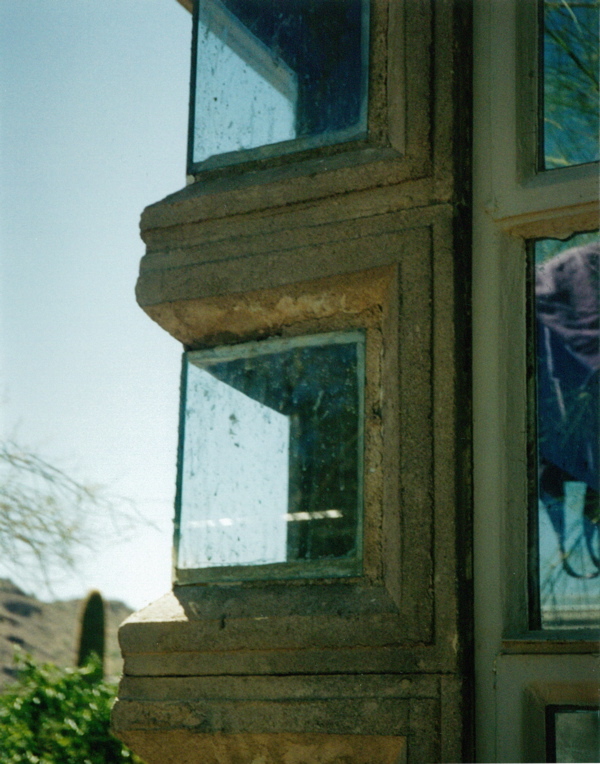 When I was there, the interior concrete was being carefully cleaned, window framing sandblasted, repaired and refinished, and all other aspects of the original Wright interior were being restored. The addition touches the original only at one point, and is held 8 to 24 feet away as it actually extends the grid of the original using courtyards as separation. The bad part about all of this was that the exterior was covered with foam and dryvit to insulate it and have it "match" the addition. What had been real became fake. Worse, what had been a connection between Taliesin and one of its satellites: the orientation and view, has been obliterated by the placement of the addition. The addition can be observed on Google Maps: search for the corner of N. 65th Street and E. Cheney Dr. in Paradise Valley AZ 85253. Scroll up N 65th until it makes a sharp turn to the right to become E. Cholla Dr. Click in the satellite view. The house is at the bend on the left side of N. 65th Street: look for a house that has 5 grey pyramid hip roofs. It is also one of the few houses not oriented to the streets...it is angled to face Taliesin several miles away. The original house is the portion oriented to the lower left of the footprint. 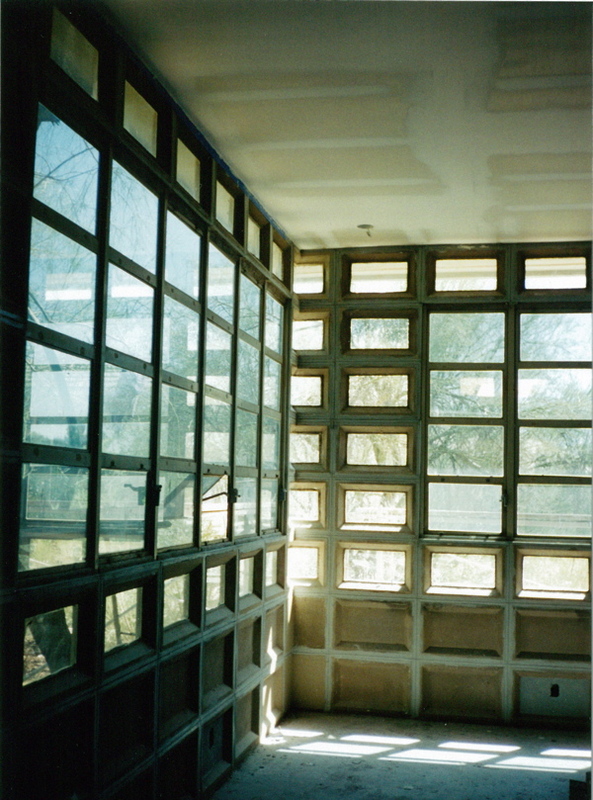 The problem with Usonian Automatics in the desert is that they cannot be cooled adequately. Tom Heinz worked on the Adelman House years ago, trying to insulate it without damaging the architecture, but could not get the interior temperature below 80. Pieper has the additional disadvantage of walls only one block thick instead of two. Roderick Grant: Temperature was definitely an issue. I was there in September of '96 and '97. With full sun and outdoor temps in the 90's most days, the interior always seemed hotter than the exterior, despite the shade. Previous owners had installed A/C and an evaporative cooler on the roof with a system of exterior ducts down the middle of the roof. Over all of this was sprayed a foam that was painted silver. The original glazing in the south facing living room windows had evidence that they had had a tinting film applied at some point, and there was a pipe trellis outside attempting to hold long dead vines, presumably to provide shade for the windows as well. It looks as if the new owners have planted wispy trees in the new courtyards to control solar gain. After reading The Natural House, I was surprised that the exterior walls were only one wythe thick. The interior surface of a southwest facing block coffer in the afternoon was literally hot to the touch. The house had a wood framed roof instead of Adelman's block roof, which appeared to have little or no insulation where the interior finish was missing. From what I have read, it was a study model of sorts for the system..maybe lessons learned were applied to the UA's that followed. Still, it was a neat little house and fun to examine. There was even a little closet in the bedroom gallery, next to a pier at the entry door, that was square in plan and bounded on two sides by blocks. The other two sides were a finish plywood door: two panels joined to form an "L" in plan, that would swing open to reveal a small coat closet and some cantilevered square shelves. Cool stuff in a hot house. � W A Storrer, "The Frank Lloyd Wright Companion"
These pictures of the Pieper house were taken in September 1996 while the house's addition and remuddling were underway. The contractor let me wander the house freely. During the hour or so I spent there, I got a good sense of how a Usonian Automatic was assembled by watching portions of it be disassembled. The house interior was stripped of all casework, fixtures and appliances, and a new drywall ceiling had just been taped and spackled. According to the contractor, all steel sash windows and doors were to be sandblasted, reglazed and reinstalled...reinstallation was underway in the fomer bedrooms...living room had not yet been touched. The addition (3 or 4 times the size of the original) connected at the northeast face of the original where the bedroom "tail" met the living/dining "head". 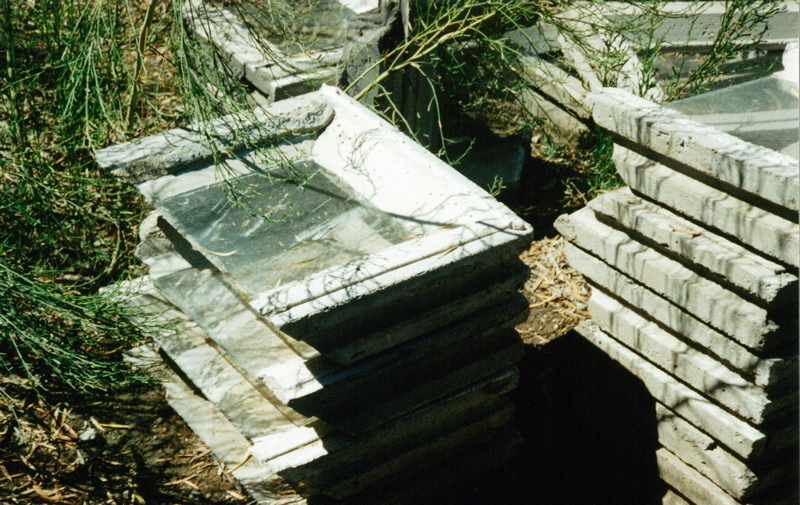 The stacked blocks were those removed for the connection. 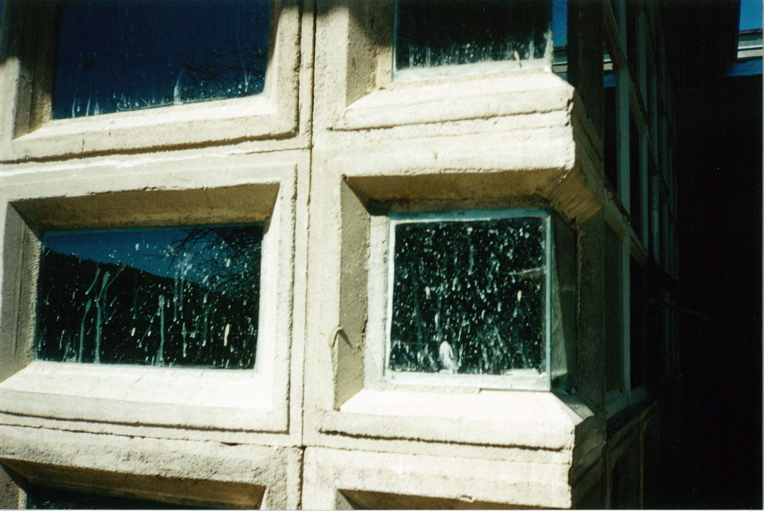 The exterior of the house (except for the window blocks) was to be covered with EIFS to introduce wall insulation to the single wythe only UA construction. Apparently, the house was a true prototype in that it had single wythe walls and a wood framed roof. 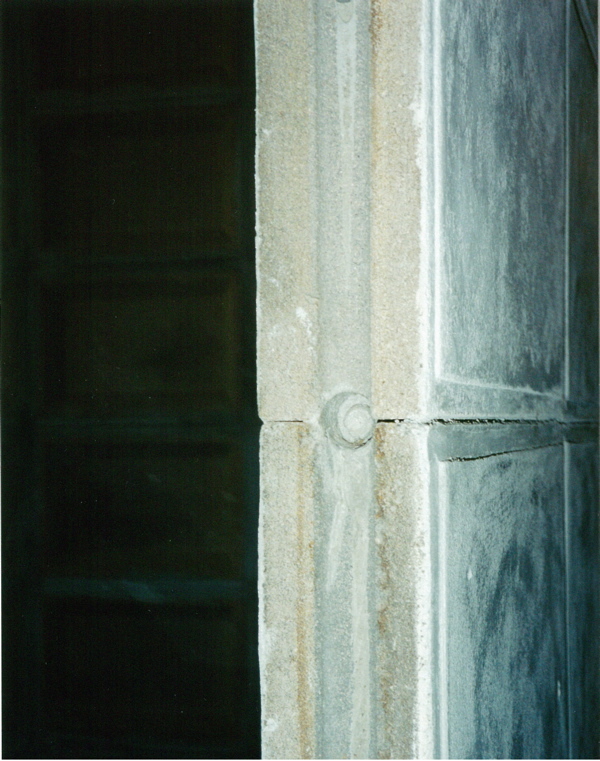 Some surfaces of the block had received a milky gray cement wash intended to provide a uniform/finish color...the tan color seen on most surfaces was the original color of the block/house interior. 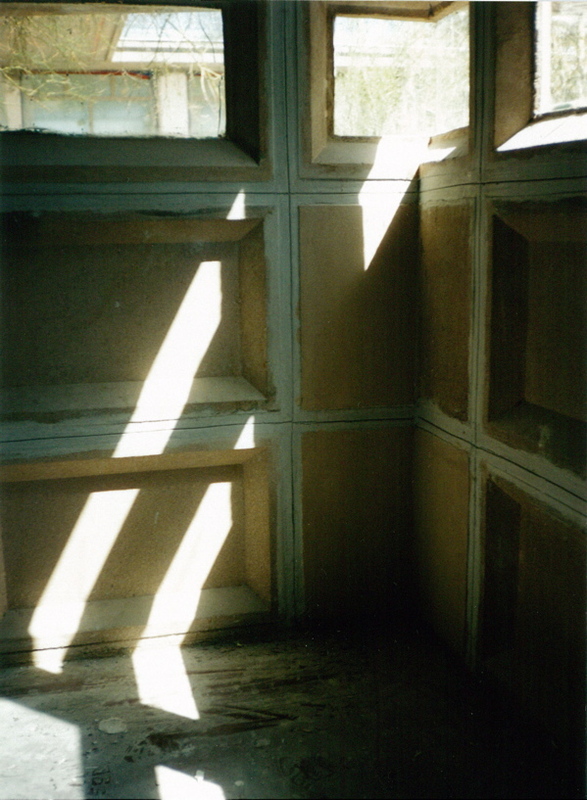 The house had an intimate feel, and the block and windows created a strong rhythm that distracted me from the rather "rough" character of the "unfinished" concrete surfaces. The lack of insulation in the walls...single thin concrete membrane...led the interior to be quite hot, as it was mid-day with a temperature of 98F or so; it made me want to build a white canvas tent over the house to shade it. Looking back on my visit to the house I find its loss even sadder now, knowing how enjoyable it is to live in a spartan example of Wright's late work. The Pieper house was a rare insight into the experimentation that went on between the textile block houses of the 20's and the more polished Usonian Automatics of the '50's. As mentioned in Storrer, Aurthur Pieper was an apprentice who ended up marrying Iovanna, at her mother's urging, in 1954. Eric Lloyd Wright was the best man at their wedding. After the honeymoon, FLW got Pieper a job at House and Home magazine in NYC. The couple eventually moved into FLW's suite in the Plaza Hotel. The relationship was tempestuous and divorce was not long in the offing after they moved back to Taliesin. Thanks for posting these photos and your reflections on the home. It is very sad that this first UA has been changed beyond most recognition. I guess the pressures to McMansion-ize can be too much for many to resist. That's why homeowners such as yourself, peterm, pharding - and the many other "caretakers" (in many cases "wonder-workers" would seem more appropriate) of Wright's architectural legacy are to be commended. One question that's nagged at me in learning more about the Usonian Automatic designs and building process is if this concept could (or even should) be resurrected and pursued today using 21st century materials and processes. Could it provide an Organic solution to lower-cost, prefab housing? I recently bought some cinder blocks from a home supply store to keep some critters out of underneath my deck and was shocked at how cheap in cost they are as a material (about $1.98 apiece). It made me imagine if there were various block options that could be purchase ready-to-go or perhaps the molds themselves made available so that a DIYer could make their own. I know this is an oversimplification of the concept and approach, and I'm sure there may be numerous zoning and engineering issues to consider, but Is this too far-fetched a concept? The Usonian Automatic system was elegant in its simplicity, unity, and by most accounts, strength, but its actual construction could be painstakingly slow and/or difficult. The system requires the blocks actually be in full contact with one another on each edge...this allows the concave edges to meet and form a circular channel into which rebar is placed and grout is poured, which ties the blocks together forming a monolithic wall or roof slab. The problem lies in the full, direct contact of the blocks with one another...any imperfection in the surfaces can develop an error of misalignment as the wall construction progresses horizontally or vertically. At times, builders actually used toothpicks to shim the blocks to minimize accumulated error. Standard masonry uses a mortar joint of 3/8" thickness between the masonry units which allows a cushion or "fudge factor" to adjust for minor imperfections in a given unit. The high cost of construction lies in the field labor involved to assemble thousands of pieces one at a time, often altering the pieces by cutting first, into a unique form. To cut cost in housing the masses, standardization and prefabrication (of components, high dollar rooms, or whole sections of the house) seems to be the answer. If the parts were mass-produced in a material that wasn't subject to changes in size/shape during and after the molding process, the difficulties mentioned by DRN might be mitigated. The obvious analogy is Legos, made of injection-molded resin. When we consider that the Monobloc chair -- one of the commonest injection-molded objects in use around the world, today -- is produced for a cost that enables the retailer to sell them for $5, we can imagine that the price of Wright-like unit blocks could be had for not much more than the $2 concrete block. Legos did come to mind in considering this...though using plastic/resin poses its own dilemma. Concrete is such a wonderful and accessible material. I wonder if it it becomes a matter of perfecting the design of the blocks themselves or adding a type of gasket element in between to avoid the issues DRN brings-up. Dry-stack concrete blocks seem to work without the fudge factor, so I don't see why UA blocks couldn't be similarly constructed. What the manufacturer does with dry-stack is run each block through a device that smoothes the top and bottom edges so they fit tightly against one another, reducing misalignments to a minimum. 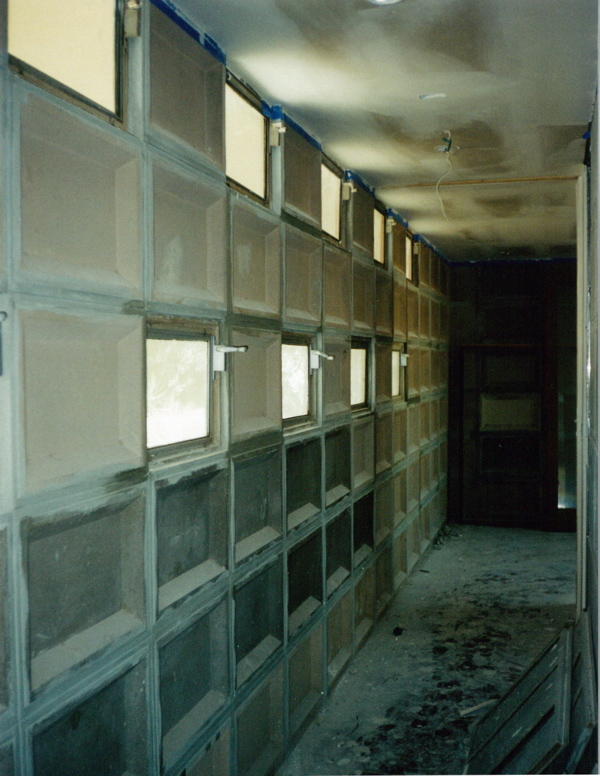 The disadvantage to dry-stack is that you have to fill the cavities with poured concrete in order to hold them in place, making the wall solid concrete at a significant cost. 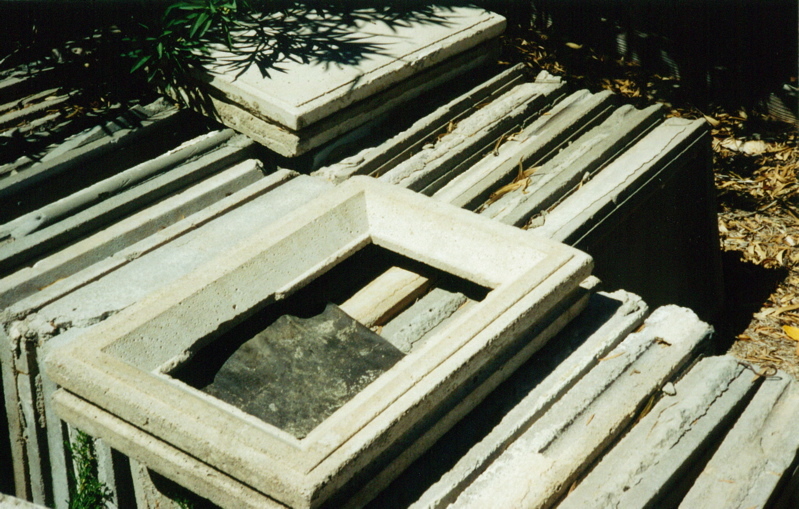 The UA type block, which fills only the cylindrical void with grout and rebar, would still leave the coffer free of concrete to act as insulation and reduce materials costs. The biggest argument against UA construction is the roof. It's necessary to hold all those heavy blocks in place while the grout dries. It can be done, even by DYIers like the Pappases. But it must be a hard task. The solution might be to go back to the block designs of the 20s, and build the roof out of wood. I second the notion that UA roofs needn't -- and probably shouldn't -- be made as a concrete slab. The mix of wood (for the second floor, as at Storer, and the roof) and concrete (slab on grade, block walls) is to my mind a benefit both aesthetically and structurally -- and, I would think, as an economy as well. Thanks for that information about the dressing of dry-stack block. I can well imagine a device that would true the Wright blocks on four edges (?) by means of grinding. I also like the idea of gasketing, as a weather/air infiltration stop. The gasket -- something as simple as a rubber tube -- could have its own groove in the edges of the block. The gasket -- something as simple as a rubber tube -- could have its own groove in the edges of the block. Quite doable in fact: Large diameter pre-cast concrete stormwater pipes have used black rubber rings as gaskets for years. They are essentially enormous rubber bands with a circular section.